"I am trying to figure out how to “shrink” down a regular Blu-Ray movie, so that I can burn it to a single layer 25gb BD-R disc for playback as BD50 is too expensive. How can we shrink BD50 to BD25 keeping all features?" Is there a way to compress a 50gb movie to fit on a 25 gb disc without losing detail on Mac? No matter how powerful it is while decrypting of protected Blu-ray movies, when it comes to compress file size of Blu-ray movies, AnyDVD HD can do nothing with it. 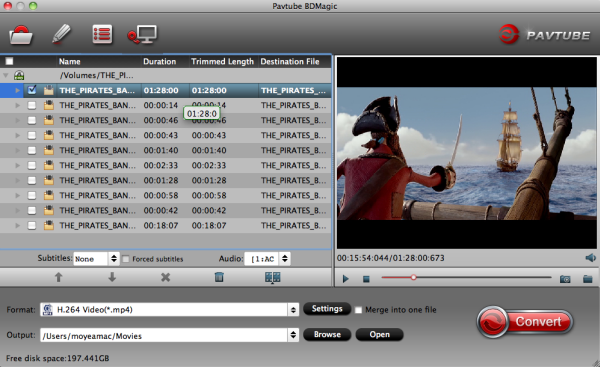 Luckily we found Pavtube BDMagic for Mac which is a magic tool to cut down your 50GB bluray movies to video under 25GB below which can fully meet users’ further needs. With its clean interface, fast converting speed and good video quality, compressing Blu-rays/DVD to playable format for various purposes will be simply finished within a few clicks. 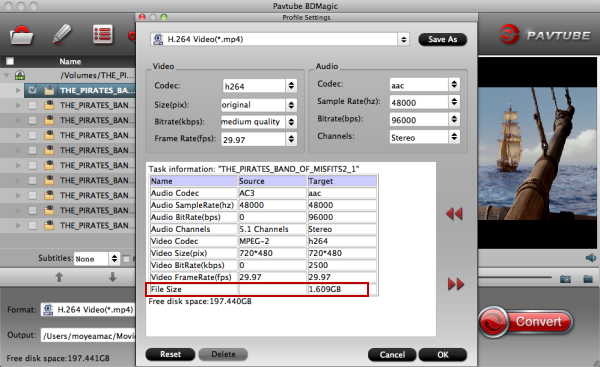 Now, let’s together have a look at how to compress file size of Blu-ray movies via Pavtube BDMagic for Mac. 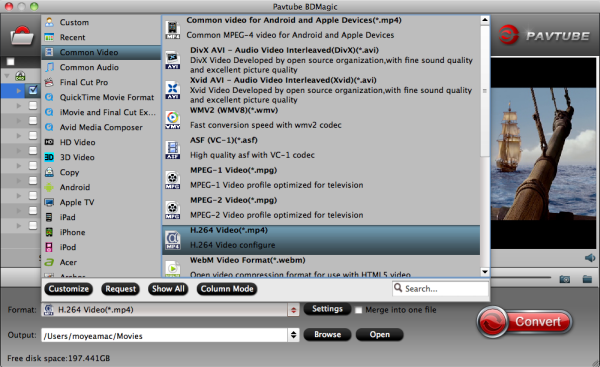 The app is also available for Mac OS – Get Pavtube BDMagic for Mac if you work with OS X 10.5/10.6/10.7/10.8/10.9/10.10/10.11/10.12. FYI: If you want to rip BD/DVD with keeping all the audio tracks (language) and soft subtitles, here’s another choice for you: Pavtube ByteCopy/ByteCopy for Mac. Note: A BD drive is needed for Blu-ray compressing and ripping. Click the drop-down list of “Format” to specify an output format according to your end use of the output files. Meanwhile, you are able to click the folder icon at the end of “Output” to browse and set a save path to store the ripped Blu-ray files. This is the key point of the entire procedures, click “Settings” button, and then the following interface will show up, on which you are able to adjust bit rate, frame rate, sample rate, aspect ratio, etc. to make control of the output file size and quality. To compress the file size into video under 25GB, what you should do is changing the figures of these options to be smaller only. Look at the target file size, keep it under 25GB. One more thing you must be sure that there will be some quality loss if you compress them to be a much smaller size, which means you’d better make a balance between the size and image quality. At least the output video quality should be acceptable by yourselves. As long as the former three steps are set well, then you can click “Convert” button to start Blu-ray ripping, at the same time, the compression task of Blu-ray file size is underway as well. Once finished, you can find out the output files via clicking “Open” button. After that you can do whatever you like with the compressed Blu-ray files. Launch Toast 11 and drag the converted mp4 file into this window, or select it from your file browser using the Select button. Choose BD-R from the Space Remaining bar graph at the bottom of the screen, and choose your BluRay burner from the Destination menu. Choose the number of copies you want to burn – each time a disc is complete; you will be prompted by Toast to insert another disc. Hit the big red Copy button, and the disc burning will begin! See details at Burn yor HD Movie to Blu-ray Disc using Toast. Now insert this Blu-ray to your BD player and star enjoying! This entry was posted in Blu-ray, Uncategorized.